The genocide in Darfur, Sudan, is perhaps the worst human rights crisis of the new century. This article examines the failures of the international response so far, and offers a solution based on international human rights law. Conducting an in-depth study of the Darfur genocide, and also discussing other genocides, the Article details the inadequacy of many of the international community's response to genocides, including “targeted sanctions” or international peacekeeping forces. 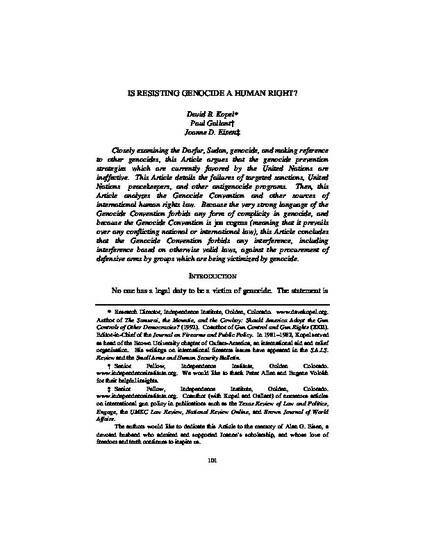 The Article then examines international legal authorities such as the Genocide Convention, the Universal Declaration of Human Rights, and the International Court of Justice, and demonstrates that groups which are being subjected to genocide have a legal right of self-defense. International treaties, Security Council arms embargoes, or national gun control laws cannot lawfully be enforced in a manner which prevents self-defense resistance to a genocide in progress, because under the international law principle of jus cogens, the prohibition against any form of complicity in genocide takes precedence over lesser laws.